Namaste and many greetings from Nepal. Adventure Treks Nepal (P.) Ltd., (Recommended by Lonely Planet (7th Edition, Page no 328, 8th Edition Page no: 333 Date: Sep 2009, 9th Edition Page no: 32, Published Date: 5th July 2012, 10th Edition Page no: 35, Published Date: Dec 2015, 11th Edition Page no: 35, Published Date: July 2018 and Trekking in the Himalaya 9th Edition Page no: 27, Published Date: August 2009 and 10th Edition. Page no: 30 Published Date: Jan 2016) is privately owned and Government registered (Family Adventure Trekking and Travel Company in Nepal). We have been providing quality travel services for over Two decade. We provide travel booking services and we specialize in escorted tours and treks. We pride ourselves on our flexibility in arranging tours to meet your individual needs. Our knowledge of the history, religion, culture , economy and politics combined with our our Guides. 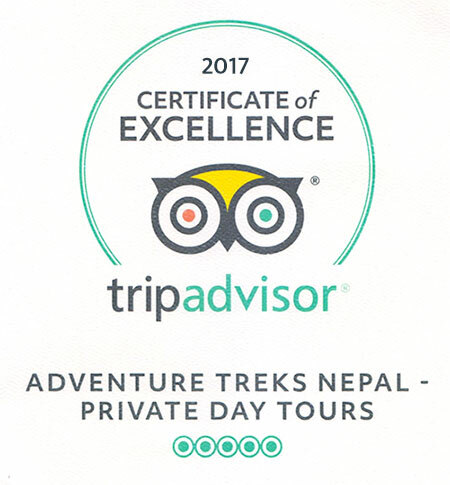 We also hold an active membership of Trekking Agencies's Association of Nepal (TAAN), Nepal Mountaineering Association (NMA), Company Registrar (Ministry of Industry), Cottage of Small Industry, Ministry of Tourism & Civil Aviation, Department of Tax, Foreign Currency Exchange, Himalayan General Insurance co. Ltd.(Insurance for Staffs) and Thamel Tourism Development Council. Why to Trek in Nepal with Adventure Treks? We design tailor-made active travel experiences in wild and wonderful destinations in a manner that is organised, safe and without losing its sense of freedom. We are for the adventurous and fun. It is about self discovery and removing ourselves from the annoyances of daily life and embarking on a journey that may change us forever. 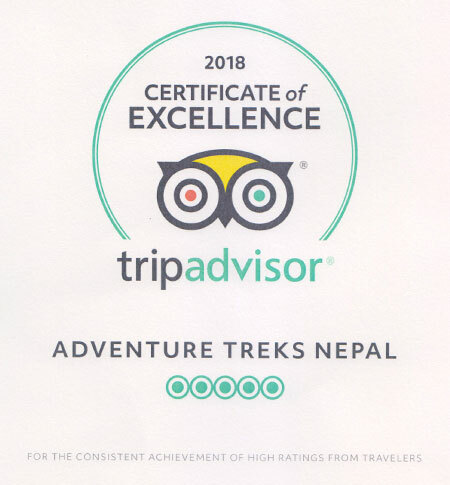 We are happy to say that we Adventure Treks is a reputed adventure travel, tour and trekking operator, registered and licensed by government of Nepal. Our trips are designed for everyone, for clients of all ages and level of experience. We are local and we personally operate each trip to ensure a reasonable cost and best value. Your safety, comfort and satisfaction are upmost in our priority. We are dedicated to make your holiday with us, a memorable one. This tour offers you an excellent oppurtunity to explore the cultural site of Kathmandu, the peaceful Pokhara along with gentle morning trek from Nagarkot. We will enjoy the cultural marvel and discover ancient Hindu .. Single day private tour to hike around Kathmandu valley is perfect for those who are looking for a taste of short trekking trips in Nepal. Nepal is well known as one of the best destinations in the world for enjoying the real beauty of nature through trekking. The trail into the interior parts of the country follows ancient foot-trails which meander through scenic river-banks, intricately terraced fields and the forested ridges connecting picturesque hamlets and mountain villages. Trekkers can walk along the rough but beautiful trails or virgin tracks in the lap of green and friendly looking hills. The rhododendron-filled, green, dark and deep forests with different seasonal flowers blossoming can catch anyone's eye as can the scattered residential cottages, domestic and forest animals, variety of birds, both Hindus and Buddhist temples, mountains, breath-taking landscape, and above all warm greeting from smiling local people. The highly developed and well-defined trails have been used for centuries. Trekking in Nepal is an all season activity. It is possible at any time of the year depending on where one wishes to go. However, the most popular season are spring (February - May ) and autumn (September-Decamber). Even during the monsoon season (June- August), you can trek in the rain- shadow areas north of the Himalaya like Mustang, Upper Manang and Dolpo. We are responsible to the environment, to our local community as well as our own crew. Thus we are environmentally aware and socially responsible thus we spare certain percent of our profit to the charity. We work directly with the local communities to find lasting solutions. The organization if fully dedicated to bring the necessary changes in the educational standard of the country whilst providing necessary support in this sector. Walking north from Pokhara - a beautiful mountain city, for a different experience in this most popular trekking destination in the country. Trekking towards the highest peak in the world, home of Sherpa people and the mysterious Yeti, is one of the most thrilling adventure.